The trade deficit narrowed to $38.7 billion in October from a gap of $44.6 billion in the prior month. The 3.2% increase in exports of goods and services and a 0.5% decline in imports of goods and services brought about a narrowing of the trade gap in October. Overall, this reading is a big plus for real GDP growth in the fourth quarter. 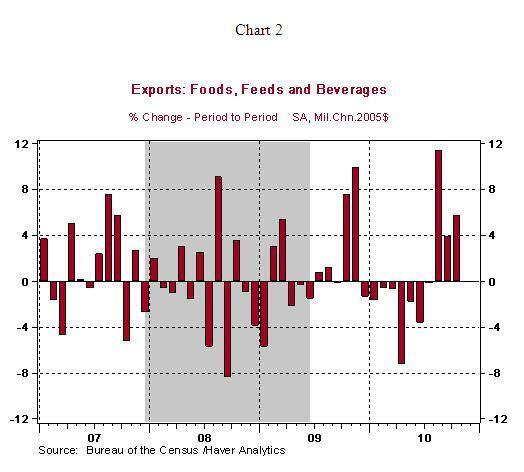 In October, exports of food items (+5.7%), autos (+4.5%) and capital goods (+1.6%) in addition to industrial materials inclusive of petroleum (+5.8%) accounted for the 3.3% gain in exports of the U.S. economy. It is noteworthy that food exports have risen for three consecutive months, reflecting growing demand for food items as growth in emerging markets allows for a larger food budget. 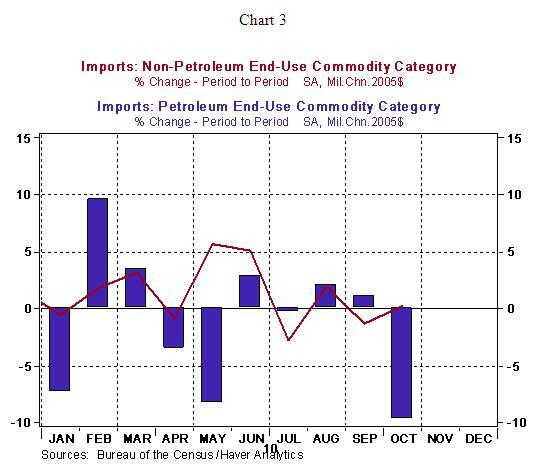 Imports of petroleum fell in October, while non-petroleum goods posted a small increase (see Chart 3). China's international trade figures for November, published today, a surge in exports. There is a strong positive correlation with U.S. imports of goods and exports of goods from China (see Chart 4), which implies that imports of goods could show robust growth in November after a tepid performance during October. 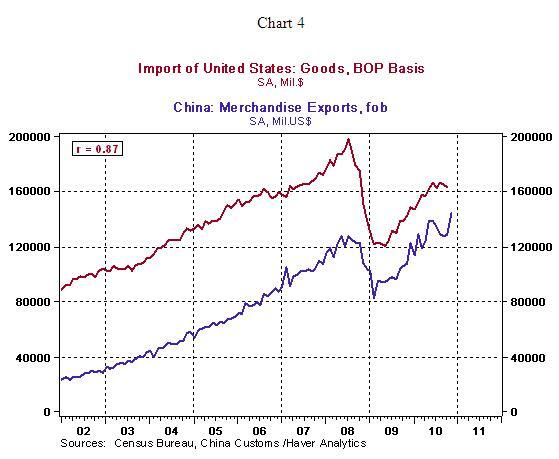 In fact, China's exports to the United States rose 14.2% in November after a 5.0% drop in October. 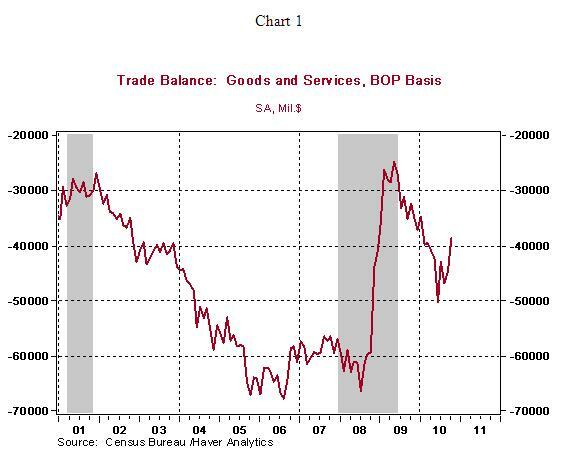 The bottom line is that trade deficit is most likely to show a large gap in November following an improvement in October. In October, the trade deficit vis-à-vis China narrowed to $25.5 billion vs. $27.8 billion in September, widened vis-à-vis the Euro area ($6.0 billion vs. $4.8 billion in September) and Japan ($6.0 billion vs. $4.8 billion in September) but was nearly steady vis-à-vis Canada and Mexico. 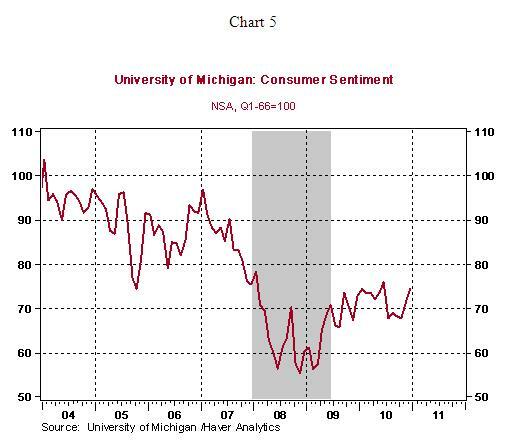 In other economic news, the University of Michigan Consumer Sentiment Index rose to 74.2 in the early-December survey and it is the best reading since June 2010. Both the Current Economic Conditions Index (85.7 vs. 82.1 in November) and the Expectations Index (66.8 vs. 64.8 in November) advanced.